Professional, Personal Pooch Pampering ... Doggone Fabulous, Darling! You love your dog. You know how you want them to look. You want a certain cut. Whether it’s a breed standard appearance you are after or a customised groom, let Doggone Fabulous give your pet the care and style they deserve. Appointments are one-to-one, so your best friend is given the undivided attention of one of our experienced, caring dog groomers. We have 20 years’ experience with particular passions for Border Terriers, Poodle crosses and all puppies. Our groomers specialise in hand stripping and Asian Fusion, but groom all breeds. Visit us at our new, purpose-fitted parlour in Crouch End, North London, between Priory Park & Alexandra Palace. Whether you have a new puppy, a nervous dog or you simply want to find a new groomer, bring them in, sample the salon, meet our groomers and book your pet in for their first Doggone Fabulous groom. We do everything according to your dog’s needs. As your local pet groomers, we also sell brushes, shampoo and other goodies to keep your dog pampered between grooms. Esmae’s Pantry dog treats are also available, these are made of all natural ingredients, locally sourced with no preservatives, colouring or additives. What makes Doggone Fabulous stand out? We are not on a production line. We don’t ask our groomers to each squeeze in 8-10 dogs a day, instead our groomers handle 4-6 dogs a day to ensure that your pet is properly catered for. We take our time, we check the dogs thoroughly and we make sure that they are healthy. In short, we care for your pet. Our one-to-one grooming services includes educating you on how to get your pet looking the way you want it to look between grooms. We will help you to create the look for your dog. We style to your requirements, either breed standard or personalised – the choice is yours. Our bathing process has been perfected over the past 10 years. We use high-quality products, so the treatment lasts longer and is better for your dog’s skin. We offer one-to-one care. Your dog will have his or her individual groomer. No cages. We pride ourselves on offering a place where your pet is happy. While he or she is waiting for you to collect them, they will be housed on open beds, not caged up. Unsure whether we are right for you? We offer a free consultation to discuss the specific requirements of your dog. 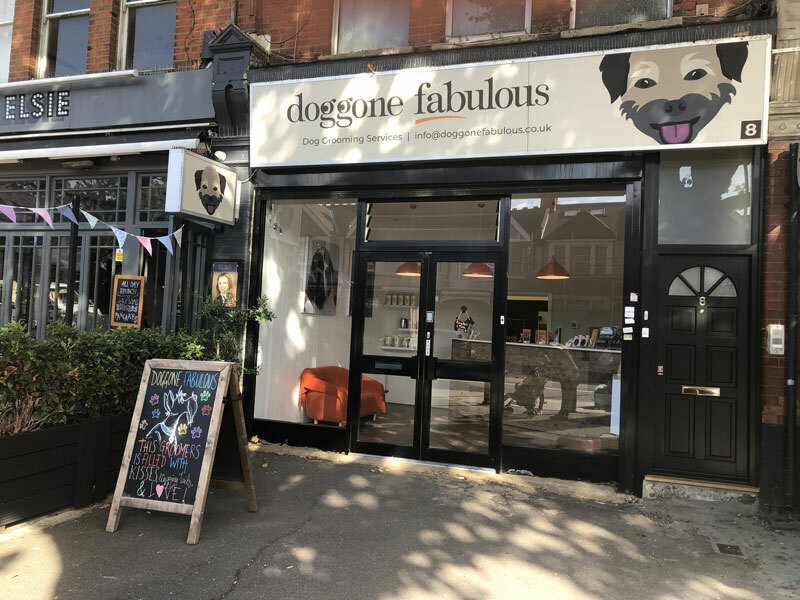 Come and visit your local dog groomers in our new grooming salon at 8 Priory Road, N8 7RD fitted out and designed with your pet’s comfort in mind. We are opposite Priory Park in a small parade of shops. These include the delightful Elsie Café, a great local vets – Zasmin Vets, a wonderful convenience store and The Priory Fish Bar, who serve a delicious fish & chips. On the left, just past the fire station on Priory Road. On the right, just after the Army Reserve Centre. There is a drop-off point at the rear. Parking restrictions across the road apply between 11am-1pm, the bus lane only from 7am-10am and 4pm-7pm or there is free parking on the adjoining roads. At Doggone Fabulous, we look after your pet as if it is our own. © 2019 Doggone Fabulous, Inc.